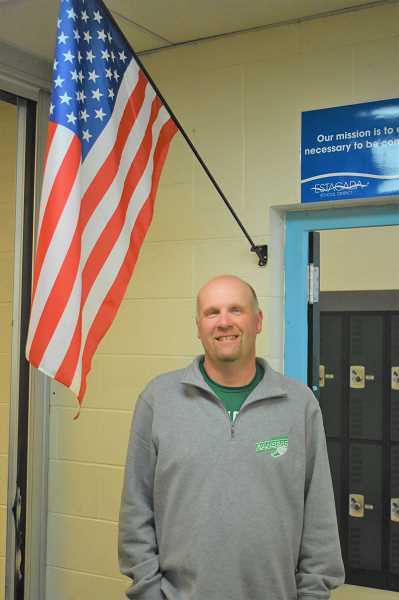 An Estacada educator has been named the Veterans of Foreign Wars Teacher of the Year. Estacada High School history, government and psychology teacher Jon Erickson received the award on Friday, March 22. According to the VWF website, the award recognizes "exceptional teachers for their outstanding commitment to teaching Americanism and patriotism to their students." Erickson, who was nominated by Estacada High School Principal Bill Blevins, said the recognition came as a pleasant surprise. "It's neat to be honored. I don't think about how what we're doing is received by other people. I don't look back and say, 'Where are the metals and the awards?'" Erickson added. Erickson received the award from VFW Post 4273 in Sandy. He has been a part of the Estacada School District community for 22 years and has taught at Estacada Middle School and Estacada High School, striving to teach critical thinking in all of his courses. "(I ask students to) see the reasons why choices were made the way they were made, and what the consequences are," he said. "Government asks students to truly understand their responsibility of voting, and history (focuses on) the narrative of events that the U.S. has gone through." Erickson sees many benefits to students having this knowledge. "Kids have a broader perspective of what it means to live in this country," he said. "Students start to understand that there are other perspectives, and as they take time to shape their beliefs, they can take the time to listen and understand other perspectives. It's not our job to tell them what to believe. Our job is to make sure they listen to what's out there and make informed decisions." This kind of analysis is what drew Erickson to teach history and government. "I have a fascination with how we ended up where we are today, and how that impacts us as we move along," he said.